Hipparchus' geometric model of the apparent orbit of the sun around the earth can also be used to describe a heliocentric planetary orbit. The model is illustrated in Fig. 18. The orbit of the planet corresponds to the circle (only half of which is shown), where is the perihelion point, the planet's instantaneous position, and the aphelion point. The diameter is the effective major axis of the orbit (to be more exact, it is the line of apsides), where is the geometric center of circle , and the fixed position of the sun. 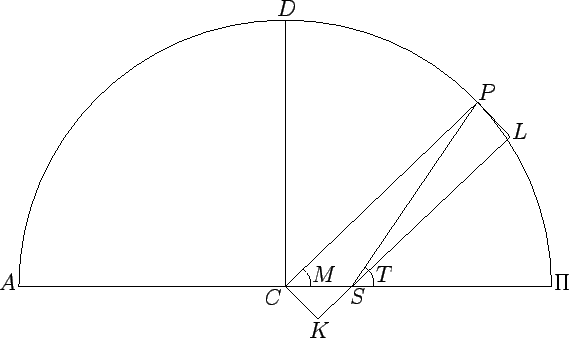 The radius of circle is the effective major radius, , of the orbit. The distance is equal to , where is the orbit's effective eccentricity. The angle is identified with the mean anomaly, , and increases linearly in time. In other words, as seen from , the planet moves uniformly around circle in a counterclockwise direction. Finally, is the radial distance, , of the planet from the sun, and angle is the planet's true anomaly, . Figure 18: A Hipparchian orbit. It can be seen, by comparison with Eqs. (81) and (82), that the relative radial distance, , in the Hipparchian model deviates from that in the (correct) Keplerian model to first-order in (in fact, the variation of is greater by a factor of in the former model), whereas the true anomaly, , only deviates to second-order in . We conclude that Hipparchus' geometric model of a heliocentric planetary orbit does a reasonably good job at predicting the angular position of the planet, relative to the sun, but significantly exaggerates (by a factor of ) the variation in the radial distance between the two during the course of a complete orbital rotation.